This article will guide you through installing and configuring Acrolinx for Drupal. You'll need administrator rights for both Acrolinx Server and Drupal for many of these steps. Download the Acrolinx for Drupal .zip file from your company download area. In the Drupal Manage panel, navigate to the Extend > List tab. Click + Install new module . Upload the Acrolinx for Drupal .zip file and click Install . Navigate to the Extend > List tab again, find the Acrolinx module under the heading Custom , select the check box, and click Install . Do you have Embed Check Data enabled? In the Drupal Manage panel, navigate to Structure > Content types . Choose the content type that you embedded check data into (for example, Article) and click Manage fields . For the Acrolinx Check Data field type, select Delete from the OPERATIONS drop-down. In the Drupal Manage panel, navigate to the Extend > Uninstall tab. Select the checkbox beside Acrolinx , scroll down, and click Uninstall . Once you've confirmed the uninstallation, navigate to Extend > List . Acrolinx will still appear here as a module, with an unselected checkbox. We're not done yet. To complete uninstallation, you'll need to delete some module files manually. Navigate to your Drupal folder. You'll see a folder called '/modules/acrolinx'. If you navigate back to Extend > List in Drupal, Acrolinx should have disappeared as a module entirely. Now you've fully uninstalled Acrolinx. To update, you'll need to uninstall the previous version (as described above), then install the new version. In the Drupal Manage panel, navigate to Configuration > Development > Performance . Click Clear all caches . Before you can use Acrolinx for Drupal, you'll need to set a couple of things up. The first is SSO for your Acrolinx Server. To do this, follow the process in the article Setting Up Your Acrolinx Server for Single Sign-on . Finally, you need to configure Drupal to route the internal checking requests to your Acrolinx Server. 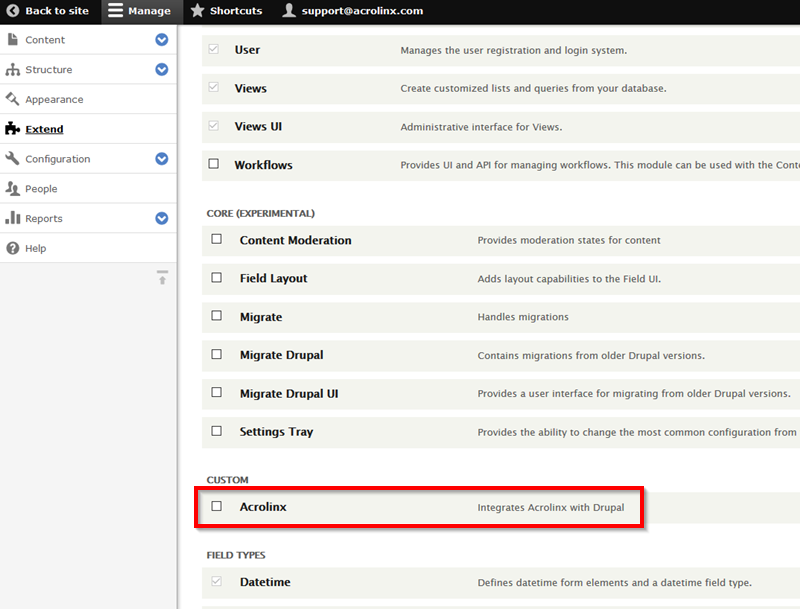 Open the Manage panel in Drupal, and navigate to Configuration > Content Authoring > Acrolinx settings . In the Acrolinx Server address field, enter the address of your Acrolinx Server. In the Single sign-on password field, enter the password that you configured in the core server properties file when Enabling single sign-on for Acrolinx . Acrolinx should now be able to run checks in Drupal! You can find some guides for added configurations below. How do I embed check data? Acrolinx for Drupal supports embedding check data directly in your Drupal documents. To activate this feature, you'll first need to make some changes to an Acrolinx Server properties file. You can find the steps in the article Embed Check Data for Sidebar Edition Integrations . Choose the content type you'd like to embed check data into (for example, Article) and click Manage fields . Click + Add field . Go to the Add a new field drop-down menu, and pick Acrolinx Check Data . Give the field a label (it can be whatever you like) and click Save and continue . You've created the new field. Drupal might land you on a page where you can edit the field settings. You can navigate away from here - leave all field settings as they are. Check data will now be embedded in your Drupal documents. Go edit some content to try it out. By default, the Sidebar UI appears in English. If you want the Sidebar to appear in a different language, you need to change your Drupal UI language.